On August 19, National Aviation Day is celebrated across the United States. It is an annual national observance that honors the development of aviation. The holiday was first observed in 1939, after the proclamation by U.S. President Franklin D. Roosevelt. August 19 was chosen on purpose because it is the anniversary of Orville Wright's birthday. Orville was the younger of the Wright brothers, renowned American aviation pioneers. He was still alive when President first issued the proclamation. Although National Aviation Day is a federal observance, it does not have the status of a public holiday. This means that government offices, educational institutions and businesses stay open on this day. However, the flag of the United States is required to be displayed on all governmental buildings on the day. Individuals are also encouraged to display national flags on their homes. Some schools organize classroom activities and trips to aviation museums that focus on the history of aviation, aviation pioneers and achievements of modern aviation. 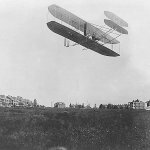 National Aviation Day should not be confused with Pan American Aviation Day, which is celebrated on December 17 and coincides with Wright Brothers Day.